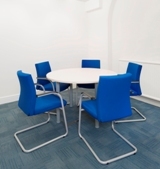 We offer three rooms for hire at our offices near Tower Bridge. 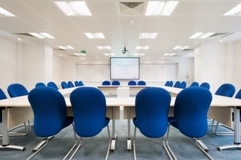 Whether you are holding a conference, meeting or hearing, running a training session or giving a business presentation, we offer smart, comfortable and competitively priced accommodation, which includes equipment hire and refreshments. The accommodation includes one larger room, which seats up to 45, two smaller rooms seating up to five, a spacious reception area and a cloakroom. 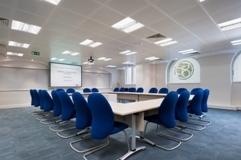 The large room (our Council Chamber) can be arranged theatre style to seat up to 45 delegates or boardroom style, which accommodates up to 26. It can also accommodate hearings. A hearing aid induction loop is available. All rooms are fully accessible and air conditioned with wireless Internet access and can be hired by the day or half-day. If required we can provide business support services such as photocopying; these will be charged for separately. For information about room hire charges download Room hire rates. There are good transport links with underground and rail stations and major bus routes nearby. See the How to find us page for further travel information. The nearest hotel is the Premier Inn, which is five minutes walk from our office on Tower Bridge Road. We offer a range of equipment to facilitate your event, including laptops, a data projector and screen, flip charts and pads and a printer. The cost of equipment is included in the room hire charges. To discuss your requirements please phone us on 020 7357 6655 ext 253 or email facilities@osteopathy.org.uk. To make a booking download and complete our booking form, which you can return by email or post. Before making a booking we advise you to read our terms and conditions.